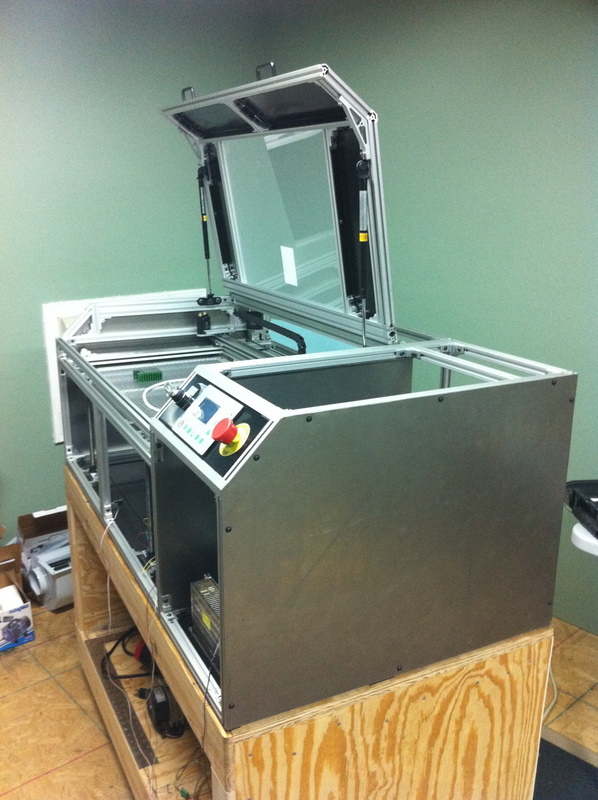 This is Part 2 of my Laser Cutter/Engraver build, you might want to check out Part 1 if you haven’t seen it. Time for a little paint! Larger sheets of steel will cover the ends of the machine. 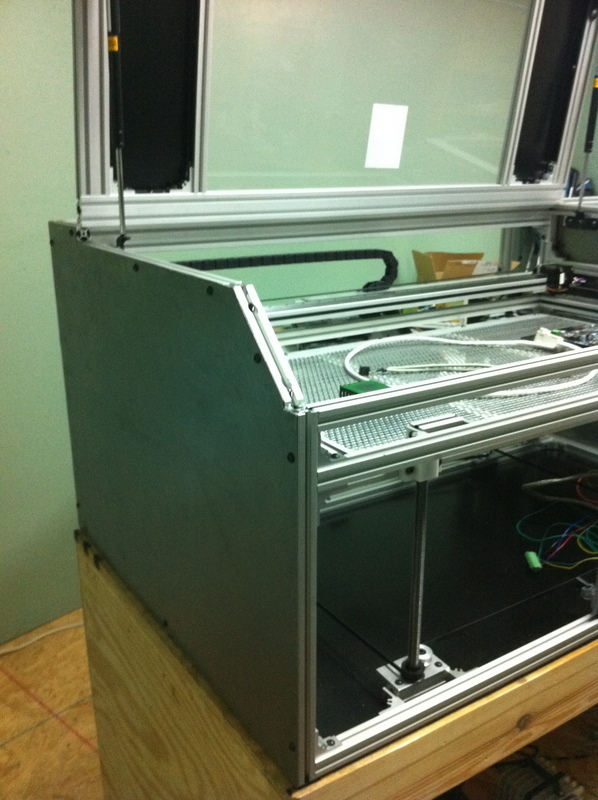 An enclosed area in the back of the machine will house the laser tube. 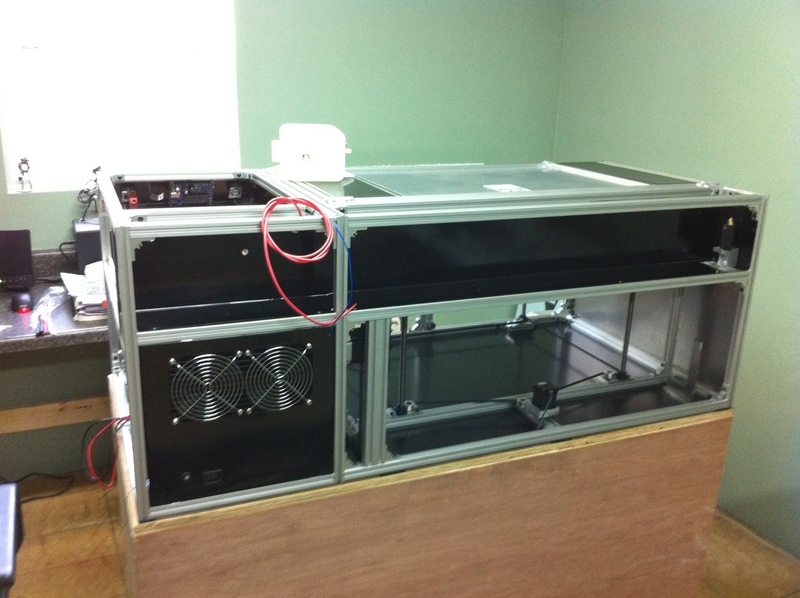 Here you can see the laser tube’s home as well as the exhaust vent for the water cooling system (laser tubes get hot). The first test fitting of the laser. The tube is actually longer than what the spec sheet claims, it just barely fits lengthwise in the enclosure. Here’s a quick clip of some glass being etched. I was still playing around with calibrating the laser power level and the speed. This is REALLY SLOW. And here’s the finished laser cutting out a design from thingiverse.com. The material is 5mm plywood that I had left over from another project. I have been thinking of a similar project, but have not found an affordable laser. Can you give me some information on the one you are using, and what is involved in getting it running? I have worked with Nitrogen Pulsed Lasers, and I have designed a controller for a Q Switched CO2 laser. I just used a cheap sealed CO2 laser from overseas. Picked it up on ebay for a few hundred bucks. I got the power supply on ebay too. It takes a PWM signal from the control board to control the laser’s power level. Pretty simple. The control board came from http://www.lightobject.com. It looks like there is an updated version here. Other than those three items you just need the supporting cooling and forced air and of course the motors and controllers. Thanks for the reply, but what do you consider as ‘cheap’, and what rated power do you get for that price? Mine is a 60W setup. You should be able to pickup a similar laser tube and power supply for around $500-$600. I would love to make a machine such as this. However, I’m fearful of lasers and potential damage to my eyesight that might happen with reflections during calibration and usage of the machine. What kind of eyesight protection procedures and safety mechanisms have you used or considered with your setup ? I would expect approppriate safety goggles, but beyond that have you considered any special covers or safety interlocks for your system ? Safety goggles are must. Do the research for the type of laser you are using and invest in the right goggles. 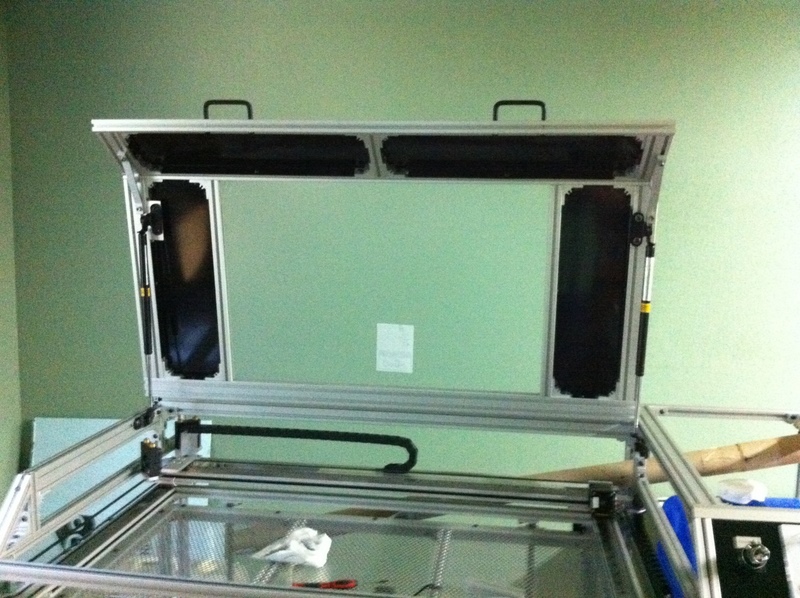 On my machine all the windows are made out of acrylic, a material that will block the laser beam. The machine will run with the door open, but I only do that for the purposes of shooting video. Normally the machine only runs with the door closed. I also have a keyed switch built into the electical supply line. The machine can only be turned on with a key that I keep in my possession. This ensures that I am present when the machine is in use. You cannot take safety too seriously with a machine this powerful, one oversight or mistake can have life long consequences. Looks really great; Thanks for sharing! But about your bottom plate: won’t you burn the black paint of it, or is your laser beam already to unfocussed at the bottom? Yup, you’re right. By the time the beam gets to the bottom of the machine it’s so unfocussed that it posses no threat at all to the machine. What was the total price for your project ? Did you have something on your self that you used or was everything bought ? What kind of materials can you work with ? I mean what kind of thickness plywood can you cut ? I see you can do that on 5mm but can you do it on 12mm ? I’d say the total price was somewhere around $3,000 USD. It could be done for less. Pretty much everything was purchased for this project. 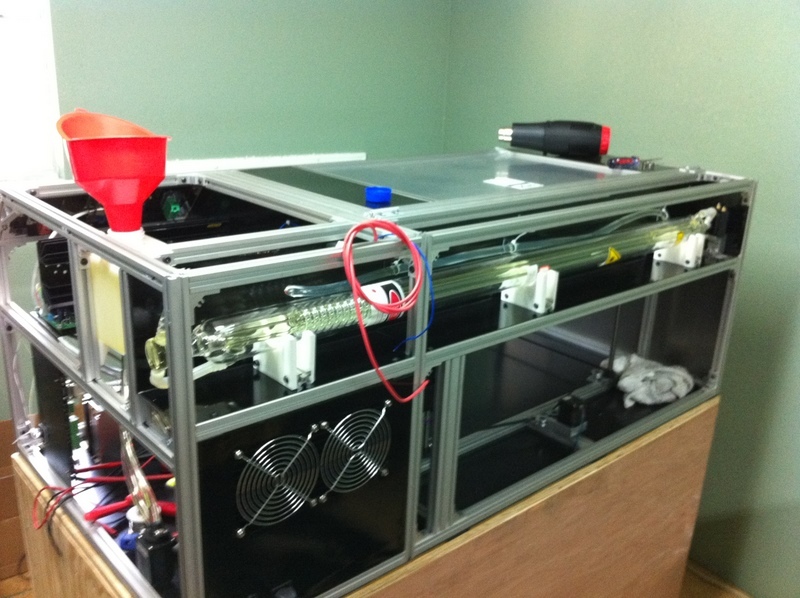 The laser cutter will work on any material that does not reflect IR light. It can etch glass, anodized aluminum, cut acrylic, wood, plastics, etc. It handles 5mm thick wood with ease. I’m not sure how thick you could go but I would think that the kerf would get excessive. For anything over 7 or 8mm I would think that a CNC router setup would be a better choice.